With this issue of the magazine, we continue our year-long celebration of Historic New England’s centennial with a range of articles highlighting the wealth and diversity of our historic sites, collections, and activities. A feature on birthday cards made by Bauhaus artists for Walter Gropius underscores the issue’s celebratory theme. Writer and NPR commentator Bill Littlefield joins the party with an ironic essay on sports inspired by historic images from the Library and Archives. As a member, you will already have one of the centennial’s new benefits—the Passport to Historic New England—whose travel theme encourages active exploration of the region. You might start with a visit to Roseland Cottage to enjoy the “carpet bedding” floral display in the parterre garden. At each historic property take note of the landscape setting, architectural details, and household items, and ponder how the previous generations lived. When you see our preservation team performing conservation and repair supported by our three-year Preservation Maintenance Fund grant, take a moment to chat with the staff and learn about their work. We think you will be inspired to contribute to this $4.8 million effort, which is ensuring the longterm health of our historic buildings and landscapes. Your contributions to the Preservation Maintenance Fund will be matched two-to-one by our generous foundation donor. the parterre garden at roseland cottage, Woodstock, connecticut. Photography by Aaron Usher. programs earn national attention for the innovative ways they use historical resources to reinforce and enrich student learning. Designed in collaboration with educators, programs align with state curriculum standards. convenient, secure shopping, registrations, and renewals The new shopping cart feature makes your transactions quick, safe, and easy, whether you’re renewing your membership, purchasing from the museum shop, registering for a program, or making a donation. expanded information on our thirty-six historic properties. Learn the history, and see highlights of the objects on display and of the surrounding landscape. Take a photographic tour and find answers to frequently asked questions, including which properties you can rent for private functions. Check the events calendar and customize your search by location, date, topic, or type of program. Partnerships, publications, and more Meet our regional partners, search back issues of Historic New England magazine and the Old-Time New England journal, take a virtual tour through our exhibitions, or read the latest news from our staff. We invite you to find your Historic New England at www. HistoricNewEngland.org. Golf game, c. 1905. the halliday historic photograph company. Memories National Public Radio host Bill Littlefield, after looking at historic photographs of sports in our collection, offers this characteristically irreverent commentary on a century of change. who only live and work there. The distinction, I suppose, is that rather than making the day’s bad news, the athletes divert us from it. —Bill Littlefield Radio commentator Bill Littlefield is author of It’s Only a Game as well as writer in residence at Curry College, Milton, Massachusetts. the red sox at Fenway park, boston, mass., c.1915. miDDLE mixed game of tennis at the spaulding estate, Dorchester, mass. bottom Football game. yankee publishing collection. Appleton as a Preservation catalyst AbovE William sumner Appleton took this photograph of a family reunion at the balch house in beverly, massachusetts, August 23, 1923. FAciNG pAGE the hooper-hathaway house, known as the old bakery, in salem, massachusetts. boston post card company collection, 1905–12. in 1914. After inspecting Parker Tavern at the request of a member of SPNEA, Appleton commented, “It will be very fortunate if the people of Reading secure so fine a specimen of early architecture for permanent safe-keeping.” He reported that the town did acquire the tavern in 1916 and later sold it to the Antiquarian Society in 1923, which still owns and operates it today. Appleton recorded many heartening and celebratory preservation struggles over the years, but his involvement alone did not guarantee success. Describing efforts to save the Bradley tavern in Haverhill, Massachusetts, in 1914, Appleton states, “This is the record of a failure.” Despite his valiant efforts to call attention to the threatened historic building by writing to various societies, chapters, and individuals, no benefactor stepped forward to buy it. The tavern was partially dismantled by a new owner, and in 1915, Appleton reported that it still stood empty waiting to be torn down. That same year, Appleton described his arrival in West Medway, Massachusetts, “just in time to see the ignominious end” of the Ellis-Shumway house, erected about 1720. Because it was the second oldest house in town, Appleton felt the house was well worth preserving, owing to its local significance. twentieth century, when systems for delivering safe, clean water to the home, distributing it within the house, and removing wastewater became universal. As early as 1829, Isaiah Rogers’ innovative Tremont House in Boston hinted at the amenities to come. Credited as the first hotel in the country with indoor plumbing and running water, Tremont House boasted eight water closets, supplied with water pumped by steam to a rooftop cistern and then gravity-fed through the system. But even as the century progressed and technological and scientific advances enabled ever smaller and more remote localities to establish public water and sewer systems, indoor plumbing remained a luxury for many households. the Lyman Estate, Waltham, Massachusetts, labeled this room a “Toilet.” Many euphemisms refer to the room in which the toilet is located, and these names shift periodically. of improving sanitary bathing in public settings, such as military installations, schools, and public bathing houses, where large numbers of users needed to bathe quickly and efficiently. Indeed, the capacity of the rain bath or spray bath (as the shower was first known) to cleanse the body, rather than simply as a therapeutic treatment, originated in these public health settings. Up to that time, the primary purpose of the overhead shower, and other specialized bath fixtures such as the sitz bath, had been therapeutic, as maladies as varied as fever, cardiac and orthopedic conditions, and insanity were often treated through hydrotherapy. One of the most iconic features of the therapeutic bath was the “needle and douche bath,” a cage-like structure of circular pipes perforated with a series of outlets (“needles”) set with separate temperature bELoW LEFt the toilet in the beck-Warren house at harvard university, cambridge, massachusetts, is a brighton model by the meyer-sniffen company, Limited. bELoW riGht the rib-cage shower bath at barrett house, New ipswich, New hampshire. features paired sinks and mirrors and glass shelving, but the two rooms exhibit entirely different approaches in taste and design. stock catalogues; the bathroom fixtures came from hotel catalogues. In addition to its paired sinks with mirrors above, the master bath features a toilet, an extra long and deep tub, a towel bar on the hot-water radiator, and half-silvered light bulbs at either side of the mirrors, intended to create flattering back light and eliminating the need for any additional lighting shade or cover. Black rubber-tile floors, white tile wainscot, and white painted walls reinforce the clean look. All the bathrooms are lit with shoulder-height ribbon windows, affording a view of the meadows and trees outside while ensuring the occupants’ privacy. Normally private and intimate spaces such as privies and bathrooms, along with kitchens, bedrooms, and children’s rooms, evoke a familiarity and connection with past lives that more formal, public spaces, whose function and customary uses are further removed from our own time, may be unable to convey. Making these personal and practical spaces a part of the museum experience gives us a fuller picture of how everyday lives were led in these homes. AbovE Located just off the front hall, the half bath, or lavatory, at the Gropius house was a rarity in houses of that period. You probably don’t think about the bathroom in your house, but did you know that indoor plumbing is a fairly recent invention? What did people do before they had bathrooms in the house? And how have bathrooms changed since people first started building them in their homes? Let’s find out…. • Get water from the well in your backyard. • Carry the water to the tub and fill it. • Set up the tub in a warm place, like your bedroom or the kitchen. • Heat the water over the fire. • Stand or sit in the tub and wash yourself with soap. The Bowen family installed indoor plumbing at Roseland Cottage, their country home in Woodstock, Connecticut, in the early 1880s. Their bathroom was complete with a flush toilet, sink, and a bathtub. What did they use this for?.... It’s a toilet paper dispenser. Toilet paper at that time came in individual sheets, like tissues today. All words run left to right or top to bottom. Answers can be found on page 32. • Use a bowl to rinse yourself off. • Drain water out of the tub. Carry the water to the back door and throw it out. • Dry off and get dressed. do you know The first flush toilet was invented by Albert Cummings in England in 1775, but even so, most people didn’t have toilets in their houses until about a hundred years ago. Before that people used outhouses in their backyards, and at night they used chamber pots, which they kept in their bedrooms. The chamber pots pictured here are fancy ones decorated with flowers. their homes be preserved; and current property owners who do not want to see their historic properties destroyed after they pass out of their hands. Interested owners may contact Historic New England staff, who will make a site visit, evaluate the property’s features, and discuss the owner’s goals for preserving the property. Should Historic New England and the owner decide to proceed with negotiations to protect the property in the Stewardship Program, the owner pays a $500 application fee, and Historic New England drafts a legal document of proposed restrictions for the owner’s consideration. When the terms of the legal document are agreed upon, Historic New England undertakes documentary photography and develops floor plans that serve as a baseline for enforcing the restrictions. Once executed, the easement is recorded in the local land records, and the property owner is asked to make a one-time contribution to Historic New England’s Stewardship Fund to support the program’s administrative and enforcement costs. Historic New England’s staff works closely with owners, visits each property annually, inspects protected features, and provides advice on maintenance and repair. When a property goes on the market, staff works closely with real estate brokers and prospective buyers to explain the significance of the protected features and provide feedback about how the house can be sensitively adapted to meet the needs of modern living. The enduring partnership between Historic New England and the owners of a protected property guarantees the survival of its historic character for the enjoyment of future generations. —Joseph Cornish Senior Stewardship Manager For more information on the Stewardship Program, visit Historic New England.org or call (617) 994-6642.
enry Bowen had such sublime self confidence and pride in Roseland Cottage, the country home he created for himself and his family, that every year he invited the president of the United States to attend his gala Fourth of July celebration. Four presidents actually visited. In 1870 Ulysses S. Grant was the first to travel to quiet Woodstock, Connecticut, for Bowen’s elegant evening party and the whole day of public festivities he’d planned: parade, patriotic speeches, and fireworks. Rutherford B. Hayes came to Woodstock in 1883, Benjamin Harrison attended twice in the 1880s, and William McKinley was there for the 1891 celebration. The garden would have been at its best and the roses at their peak when the president and Bowen’s two or three hundred invited guests strolled about the grounds at dusk, enjoying lemonade and Bowen’s own strawberries, the sound of Strauss waltzes floating out from the conservatory. Henry Bowen liked roses. He named his new house Roseland Cottage and always had it painted in some shade of pink. The house is a vivid color, still surprising to come upon, face-to-face with the bucolic town common. Equally eye-catching and just as unusual is Bowen’s elaborate flower garden. Bowen left his hometown of Woodstock in 1834, when he was twenty-one, to seek his fortune in New York City. Ten years later, he’d prospered as a silk merchant, and soon made a name for himself as a founder of an influential antislavery weekly, The Independent. He decided to return to Woodstock with his bride to create an idyllic country estate in the little town where he’d grown up. For the design of his house, Bowen turned to Joseph Wells, an architect known for his Gothic Revival churches. Roseland Cottage was in the avant-garde of fashion, with its pointed gables, fancy scrollwork, lack of symmetry, and even the bit of stained glass that set it apart from all the traditional, four-square houses that everyone then was used to. the bowens’ granddaughter, constance holt, stands among the flowers in the parterre garden, c. 1920. AbovE Family and honored guests surround henry bowen (with a white beard, middle row, center) on the Fourth of July, c. 1890. Julia Ward howe, wearing a hat, is in the back row. bottom LEft A summer house, c. 1920, like a tiny Greek temple, overlooks the garden. one flower bed is planted with bands of salmon and white impatiens. expert volunteers, some of whom have worked there for fifteen years or more. An arborist tends to the boxwood edging, trimming back each spring to keep it in its place. The gardener takes cuttings of the boxwood to be raised at the Lyman Estate in Waltham, Massachusetts, and brought back to fill in any inevitable gaps. In this way Bowen’s nineteenthcentury boxwood is perpetuated. There are as always a few shrubs in the garden in addition to the roses: lilac, hydrangea, azalea, and a wisteria. There are perennials, too, including lemon lilies, peonies, baptisia, phlox, and bleeding heart. But it is still the flamboyant carpet of annual color that distinguishes Henry Bowen’s garden. The central oval packs a wallop with three shades of geranium planted in concentric bands, or the solid mass of pink snapdragon, or the adjacent bed blue with salvia. Almost no one gardens like this anymore. Urban parks and cemeteries may have held onto the carpet bedding tradition long after it fell out of favor with private gardeners, but it’s increasingly rare. One reason is the expense of raising or buying all the annual plants each year. The other obstacle is the amount of work involved. At Roseland Cottage it takes four days every spring for the gardening crew to plant 3,500 annuals, and the labor continues throughout the season. phlox are enclosed by boxwood hedges. beyond the garden lie the stable, barn, and bowen’s own bowling alley. Bowen’s civic concern extended well beyond his own home turf. Even as he was making his own garden he ordered five hundred trees to be planted on the Woodstock Common. Prior to the nation’s centennial in 1876, Bowen purchased acreage beside a nearby lake, ornamented it with thousands of roses and shrubs, cast-iron statuary, and recreational facilities and gave it to the townspeople as Roseland Park. After he died in 1896 at eighty-three, Bowen’s family stayed on in their home and kept up the garden. 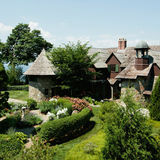 Historic New England purchased Roseland Cottage from the Bowen family in 1970. 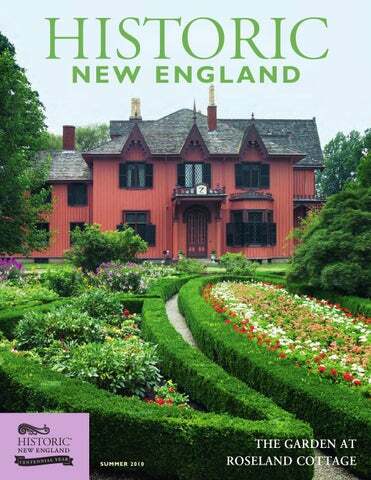 —Alan Emmet Landscape historian Alan Emmet is author of So Fine a Prospect: Historic New England Gardens. Roseland Cottage is open Wednesdays to Sundays through October 15 and hosts many special programs, including twilight concerts on the lawn, a historic gardens day, and a craft festival. The garden and carriage barn are also available for functions. For details, please visit HistoricNewEngland.org. Winslow Crocker House in Yarmouth Port; and in New Hampshire at the Barrett House, New Ipswich, will resolve issues that could threaten the structures and the collections inside. Infrastructure upgrades of plumbing and electrical systems will continue, as will improvements to our communications systems. Energy efficiency will continue to be an important aspect of our work as we analyze energy usage and make improvements across the system. We are eager to see how attic insulation over the office space at the Langdon House in Portsmouth, New Hampshire, stabilizes the office temperature and lowers the heating bills. vivat pius! AbovE At home in Lincoln, massachusetts, Walter and ise Gropius, at left, relax with long-time friend herbert bayer and his fiancée, Joella Lloyd. Architect Walter Gropius founded the influential school of design known as the Bauhaus in Germany in 1919. in 1937, he and his family emigrated to the United states, where he taught at harvard University and established an architectural practice. the Gropius family home in Lincoln, Massachusetts, is one of historic New England’s most popular historic sites. For more information, visit historicNewEngland.org. Alexander schawinsky “vivat pius!” (long live pius!) reads the heading of “Xanti” Schawinsky’s card. A teacher in the stage workshop at the Bauhaus and a graphic artist, Schawinsky became one of Gropius’s closest friends during the Bauhaus years. Always animated, he was the life of any party. The words running between the fingers of the handprint spell out the names of Schawinsky’s family: “xanti,” “ren” (his wife, Irena) and “jamin” (his son, Benjamin, whose handprint is the central feature of the card). At the bottom he signs as one composite name. ise Gropius Shown relaxing in a lawn chair at home, Gropiusâ&#x20AC;&#x2122;s wife, Ise, frames her portrait with bluebird feathers, their favorite American bird. The Gropiuses loved their new home in Lincoln, Massachusetts, in part because the wildlife was so prevalent and visible. They placed bluebird boxes throughout the property and would delight when a nesting pair took up residence. konrad Wachsmann Konrad Wachsmann was one of many European refugees who passed through the Gropius House during the years before and after the war. He stayed in the house for more than a year and was living there at the time of Gropiusâ&#x20AC;&#x2122;s sixtieth birthday. Gropius spent evenings with Wachsmann in the basement developing a system using prefabricated panels to reduce the cost of constructing housing, a goal to which both men were passionately dedicated. The panel connector they were working on together is what seems to be strangling Wachsmann in this image. Lyonel Feininger Lyonel Feininger made this woodcut of the Gelmeroda church years earlier, when he ran the printing workshop at the Bauhaus. The church was one of his favorite subjects during the time he was in Weimar, the school’s first home. The card harks back to the beginning of his friendship with Gropius, around 1919, when Gropius, the school’s founder and director, invited the American-born Feininger to join the faculty. helen storrow It was due to Mrs. Storrow’s generosity that the Gropiuses were able to build their house in Lincoln. A prominent philanthropist, she not only offered them the land on which to build but also subsidized the construction of the house when no bank was willing to lend them money to build such an unusual-looking design. For her contribution to the birthday cards, Mrs. Storrow worked a scene in needlepoint depicting some of the local flora and fauna, a subject dear to all of them. She clearly knew, and likely shared, the Gropiuses’ affection for the red-breasted bluebird. Josep Lluis sert Sert was one of the many architects from around the world with whom Gropius was friends. The two had become acquainted through their work with the Congrès International d’Architecture Moderne (CIAM), an organization founded in 1928 to formalize and promote the architectural principles of the Modern movement. The Spanish-born Sert glued photographs of himself and his wife, Moncha, onto a picture of figures in traditional Spanish costumes. Like the Gropiuses, they had recently relocated to the United States. Ten years later, Sert was named dean of Harvard’s Graduate School of Design, whose architecture department Gropius had chaired. marcel breuer While a student at the Bauhaus, Breuer became one of Gropius’s most talented and prolific protégés. In 1925, he was invited to run the school’s furniture workshop, where he piloted the use of tubular steel in furniture. He followed Gropius to London in 1935, and then, two years later, to Harvard. On his card, Breuer depicts himself in anguish, thinking about his new wife, Connie. The image doubtless was a joke between Breuer, formerly a confirmed bachelor, and Gropius. The allusions made by some of these cards would have been clear to Gropius, but to us, nearly seventy years later, the deeper meanings can be obscure. Painting your house? You can buy these paint cards at our Museum Shop at HistoricNewEngland.org or by calling (617) 994-5925.
holstein cows at Graywall Farms in Lebanon, connecticut. Farmer’s cow fresh local milk and cream is sold in nearly three hundred stores in southern New England. riGht the farmers of the Farmer’s cow. As part of Historic New England’s centennial celebration, we are offering an overview of preservation in the region by showcasing the statewide nonprofit preservation organization of each state. These organizations function as advocates for monitoring, promoting, and coordinating historic preservation efforts at the state level and work closely with their respective state historic preservation government offices. reserve Rhode Island has two primary program areas: Stewardship, taking care of historic properties today so they will be around for everyone, forever, and Preservation Services, sharing our expertise statewide, helping others be good preservation stewards. Collaboration is a key strategy for success, extending our limited resources to: • Raise public awareness of threats to Rhode Island’s heritage places. The Rhode Island Preservation Watch identifies trouble spots and opportunities where citizen action can make a difference. • Empower non-profit organizations through our Business Planning Initiative with the Historic Sites Coalition, a network of fifty-six organizations that manage historic sites for public use. participants in an Economical homeowner Workshop visit the c. 1724 philip Walker house in East providence, rhode island. portrait of benjamin Gerrish (1717–1772) by John singleton copley (American, 1738–1815), 1770–1772. bequest of Frances s. Warrick.